Rich in culture and history and with stunning Alpine scenery, Austria has everything you need for a memorable holiday. To find the perfect luxury camping site and check availability please contact LUX-camp. Why is Austria perfect for a luxury camping holiday? Austria is a German-speaking country and its culture is redolent of its past as the centre of one of Europe’s greatest empires. 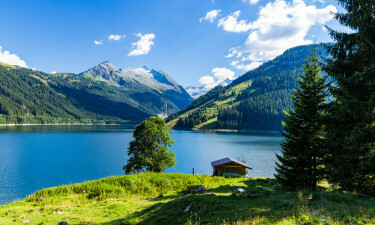 While the snowy winters make it perfect for skiing holidays, Austria’s temperate summer climate makes it the perfect backdrop for outdoor activities such as hiking and mountain-biking. 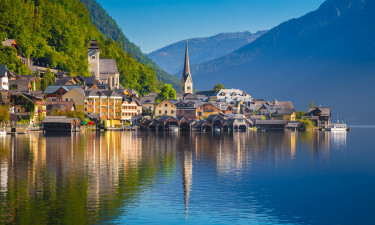 With some of the highest peaks in Europe, alpine wildflower meadows, villages with cobbled streets, and cities offering wonderful restaurants and world-class music, a holiday in Austria has something to offer everyone. The picture postcard landscape of Salzburgerland offers wonderful walking and cycling trails and in the baroque city of Salzburg you can follow the Sound of Music trail, before checking out the fairytale architectural highlights of this UNESCO World Heritage site. Relax with a coffee at one of the many cafes and restaurants and sample the local speciality of Mozartkugel, a cake with nougat and marzipan that commemorates the city’s most famous son. Your camping holiday in Styria will allow you to relax right in the green heart of Austria. 60% of the region is covered in verdant forest, and you will discover ancient castles to explore and rolling vineyards where you can sample the region’s fine wines. Enjoy a boat trip on one of the numerous lakes or tee off at Styria’s 18 golf courses. Tirol offers some of the finest skiing in the world during the winter months and in summer is a paradise for hikers and climbers with stunning views of mountain peaks and valleys. Canoe or swim in the lakes and explore the local towns: Innsbruck boasts magnificent architecture, ranging from medieval to very contemporary. Tirol is renowned for its local festivals throughout the year. 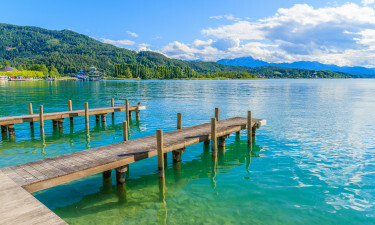 Beaches and Nature in Austria From vibrant swimming beaches to quieter shores, Austria’s lakes offer a beach holiday with a difference. The best Alpine beaches include the Wolfgangsee, in Salzburg, and Lake Achensee in Tirol. Canoeing, diving and pedalos are available in the resorts and the water quality at all the popular beaches is grade A. Austria boasts 6 national parks and 60 nature reserves. 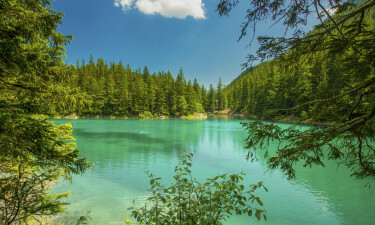 A camping holiday maximises your time to relax surrounded by the pristine natural environment.Attractions in Austria The amazing scenery and the opportunities for adventurous camping holidays are what attract many visitors to Austria. Luxury camping in a mobile home allows you wake up each morning to views of valleys, waterfalls and mountains. Austria has a rich cultural heritage, with museums, art galleries, traditional festivals throughout the year. Vienna, the country’s capital on the River Danube, is home to the Kunsthistorisches museum, which houses magnificent artwork and the Schoenbrunn palace is not to be missed. Austrian food is rich and hearty, featuring stews with dumplings and crispy wiener schnitzel. Desserts include apple strudel with cream and many well-known cakes such as the chocolate Sachertorte. White wines such as Riesling and Neuburger go well with the superb food and there are over 360 brands of local beer to sample. Austria‘s temperate continental climate is moderated by the influence of Atlantic weather systems. The east of the country has hot summers, low rainfall and moderately cold winters while the Alpine region has more precipitation, short summers and long, cold winters. Holidaymakers should check local weather reports before starting a walk or hike in the mountains. Archaeological finds in Austria date from the Neanderthal period and by the Iron Age the Celtic Hallstatt culture was well-developed. During the Middle Ages, the Holy Roman Empire was ruled by the Hapsburg dynasty and the Austro-Hungarian empire has left a rich legacy of palaces and gardens. Now part of the EU, Austria adopted the Euro in 2002.